From ACOM we consider that the statements of the priest Javier Baeza contain basic elements of anti-Semite narrative that are improper of a member of the Catholic clergy, who should look out for coexistence and inter-faith dialogue and not promote the stigmatisation of a minority such as the Jewish one and the discrimination based on origin or creed.Perhaps we should remember that statements and insinuations like “Less than a month ago we showed a documentary on migrations by Nico Castellanos and nobody said a thing. I imagine that blacks dying for 30 years aren’t as important as the powerful Jews of Madrid” can be catalogued as a typical libel that brings to mind the worst anti-Semite clichés, according to the definition of the IHRA (International Holocaust Remembrance Alliance), which the European Council called to include in the laws of the member states. The priest declared: “The proposal came to us from the BDS association (Boycott, Divestment and Sanctions)”. We feel obliged to invite the priest to make the minimum effort of knowing in depth what the radical and anti-Semite BDS movement really promotes, so that situations like this do not occur again. The priest should have enough humility to acknowledge that he has been manipulated by an extremist movement and that the actions of the Archbishopric, much better informed, has prevented the disgrace of a premise of the diocese from being used to criminalise the people that even Pope Francis has called “our older brothers”. The BDS movement is an unequivocally anti-Semite movement. 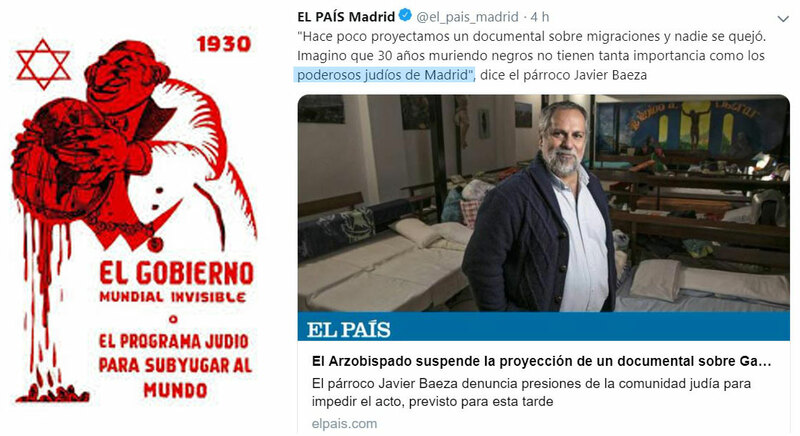 This movement that, with its false solidarity with the Palestinian people, intends to curtail the liberties of the Jews in Spain, constantly harassing the only Jewish state in the world and the only democracy in the Middle East. At the international level the condemnation of the BDS movement and their consideration as anti-Semite and promoters of hate is relevant. Innumerable artists, politicians, writers, philosophers, businessmen, scholars and even prominent Palestinian personalities have denounced and condemned publicly how perverse and dangerous the BDS movement is, glorifying jihadism and with proven links to terrorist groups. ACOM focuses a large part of its efforts in the fight against anti-Semitism on combating the activities of the BDS movement and Podemos in Spain and its attempts to criminalise and dehumanise the Jews, as well as the instrumentalisation of the Spanish public institutions to promote hatred, the exclusion based on national origin and the promotion of anti-Zionism, the new face of the old anti-Semitism. 40 court rulings against this sectarian BDS movement prove that its promotion by the priest of San Carlos Borromeo is a particularly sad and worrying fact.